Published: Jan. 14, 2018 at 08:09 p.m. Updated: March 29, 2018 at 09:11 p.m.
Stefon Diggs reeled in a 61-yard touchdown catch-and-run with no time remaining to cap a wild Vikings 29-24 win over the New Orleans Saints and send Minnesota to the NFC Championship Game in Philadelphia. 1. Vikings fans knew the feeling when Wil Lutz's 43-yard field goal split the uprights with just 25 seconds remaining. Disappointment. Shock. Acceptance. Minnesota had entered the second half up 17 points until Drew Brees, Michael Thomas and Alvin Kamara marched repeatedly down the field, wiping that lead away completely with a Kamara TD catch with three minutes to go. When Kai Forbath knocked in a franchise-record 53-yarder with 90 seconds left, it looked like maybe, just maybe Minnesota had exorcised its kicker demons of years past. But New Orleans' ensuing drive and Lutz's score quickly wiped those sentiments away. Same old Vikings. What happened next will be, and is already, the stuff of Minnesota legend. With time running out and Minnesota on its own 39-yard line, Case Keenum connected with his top target, Stefon Diggs, on a prayer of a pass. Diggs high-pointed and reeled in the ball and, on his way down, escaped the armless tackle of Saints rookie Marcus Williams. 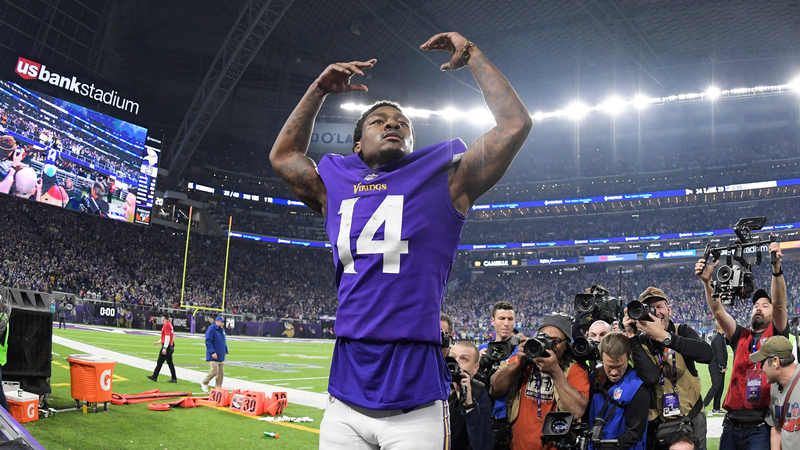 With no Saints defender ahead of him, Diggs sped off toward the end zone, sealing an improbable back-and-forth win and sending U.S. Bank Stadium into utter bedlam. These types of fortuitous bounces and plays don't usually happen to the Vikings in the postseason; but this season has been anything but usual. With a journeyman at quarterback and multiple injuries at key positions, Minnesota wasn't expected to win its division this year, less so reach a conference championship game, one where it'll likely be the favorite. This is a new feeling in Minneapolis, and one the Vikings should relish for the next week and forever, for that matter. But they shouldn't be satisfied with it. This Vikings team is one win away from being the first to play a Super Bowl in its home stadium. Thisclose to making history. So after Sunday night's thrilling turn of events, why stop now? 2. There would have been no dramatic topsy-turvy finish without a furious comeback from the Saints. Brees shrugged off a miserable first half, in which he threw two picks and posted a 0.0 passer rating in the first frame, to lead four scoring drives in five attempts in the second half to make this thing interesting. While New Orleans' playmakers were held mostly at bay through the first 30 minutes, they exploded for key gains in the second half. Thomas and Kamara, the future of football in New Orleans, combined for three second-half touchdowns. Thomas, in particular, was a lightning rod, and if things had gone differently, would have been Public Enemy No. 1 in Minneapolis. Thomas redirected the trajectory of this contest when he collided with -- and debatably targeted -- Vikings safety Andrew Sendejo on a red-zone route, knocking him out of the contest. On the very next play, Thomas beat an irate Xavier Rhodes for a TD, and did it again on New Orleans' drive. The Saints' anemic first half sank their hopes of controlling this game instead of playing from behind, but the future is bright in New Orleans with Thomas and Kamara leading the way. Whether Brees can lead them this close to glory again before retiring will be the question. 3. The game's most complete unit resides in Minneapolis. Long overlooked for a variety of reasons -- Keenum at QB, few household names, defense-first team -- the Vikings held on in part due to an amazing first-half performance from their All-Pro defense. With Pro Bowlers and playmakers at every level, Minnesota frustrated Brees and Co. from the get-go, creating mismatches and disrupting one of the league's more dynamic attacks. Everyone is capable of making plays in Minnesota. Sendejo made an insane adjustment to reel in Brees' first pick; Everson Griffen tipped an interception at the line, without even looking at it; and the secondary combined for eight passes defensed on the night. Rivaled only by Jacksonville's defense and New England's offense, there is no better unit remaining -- no group that plays more complementary, total football -- in the postseason than the Vikings' defense. 4. Can Case Keenum get some respect now? Lumped in with Blake Bortles and Nick Foles as a quarterback who holds his team back more than helps it succeed, Keenum joined them in the championship round with Sunday's win. Take that. The journeyman nary threw an errant ball Sunday, save for a third-quarter throw-it-up interception, and despite New Orleans' attempts, led two "game-winning" drives in the fourth quarter. His numbers didn't flash on the stat sheet, but Case's deft dispersal of targets spaced out Dennis Allen's young defense and kept it on its heels -- five Vikings earned at least three receptions on Sunday. Lethal on third downs, Keenum (318 yards, TD, INT) needed no honeymoon period in his first postseason start either, leading Minnesota on scoring drives during three of its first four possessions to help set up a 17-point lead at halftime. But of course, it's not how you start, it's how you finish. Turns out Keenum, benched by Jeff Fisher just 14 months ago for a clueless Jared Goff and written off as a destined career backup, knows how to do that too. Keenum's play Sunday should inspire praise and confidence, not derision, from critics this week, as he prepares to play another top secondary in Philadelphia. Keenum isn't a game-manager anymore. He's a proven winner. 5. Channeling his inner Andy Reid, Saints skipper Sean Payton lost two timeouts on one fourth-quarter drive in a questionable exercise in time management, one that could have backfired. Payton attempted and lost two challenges over the span of four plays and 90 seconds of game-time, leaving New Orleans with just one timeout as it attempted, and nearly completed, its comeback. Both decisions to challenge could have been thwarted with some close replay watching, so it's fair to wonder what type of intel Payton was getting from his guys upstairs. The Saints didn't use that timeout until there were 18 seconds left and Minnesota was attempting its winning drive. Three plays later, Diggs was in the end zone. 6. If you're into witchcraft and mystic tomfoolery and curses and inexplicable behavior surrounding the Minnesota Vikings franchise, then Sunday's game was an unapologetic counterpoint. Minnesotans need no reminding how "unlucky" their football team has been over the years; the Vikings have found many awesome ways to lose in the postseason, most memorably in 1999, 2016 and 2010 against the Saints. But the energy around this iteration of the Vikings is different. It's confident, possibly, likely, definitely stemming from their shiny new stadium, which will host Super Bowl LII in three weeks, the manic fan base inside it and the underdog quarterback who epitomizes the franchise's spirit. I will resist to throw around the words "fate", "destiny" and "serendipity" without quotation marks until these Purple People Eaters make the Big Game. But there's something special going on in Minneapolis, and it was on display for the nation to see on Sunday evening. Stefon Diggs reeled in a 61-yard touchdown with no time remaining to cap a wild Vikings 29-24 win over the Saints. Relive the final play from all angles from the field.